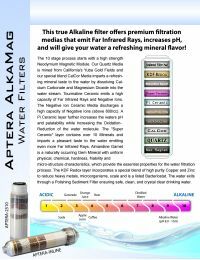 The APTERA-2510 is a true alkaline ionized water that uses premium medias that emit Far Infrared Rays, increases pH, lowers ORP, and gives your water a refreshing mineral flavor. 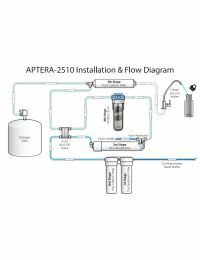 The Aperta-2510 ionized water filter is recommended for post RO (Reverse Osmosis) and includes a neodymium magnetic module. It should be placed between the permeate side of the membrane and the RO holding tank (See Diagram). The Aptera alkaline water filter requires a very slow flow rate of 0.025 gpm in order for the water to have sufficient contact time with each of the medias.